Artist’s depiction of the BFR spacecraft encircling the Moon. That SpaceX has revived its lunar intentions shouldn’t come as a complete surprise. Back in June, when the company canceled its plans to send a pair of space tourists around the Moon, SpaceX insisted that it was a postponement, and not an abandonment, of the company’s space tourism ambitions. “SpaceX is still planning to fly private individuals around the moon and there is growing interest from many customers,” said James Gleeson, a company spokesperson, at the time. What’s more, it was obvious why the company had postponed the lunar mission. Back in February, Elon Musk admitted that the Falcon Heavy, just one day before its inaugural launch, will not be rated for human space travel, saying SpaceX will instead focus its energies on developing the Big Falcon Rocket (BFR)—a strong hint that the company was intending to use the BFR launch system, and not the Falcon Heavy and Crew Dragon Spacecraft, to deliver humans into space. Yesterday’s surprise tweet suggests SpaceX is inching closer to its ambitions. The name of the passenger will be announced on Monday, September 17, at 9pm ET, which you’ll be able to watch here. No timelines or other details were provided by SpaceX. Hopefully, we’ll learn more on Monday, as the SpaceX hype machine continues to rev on all four cylinders. Interestingly, the illustration accompanying the tweet showed a slightly modified version of the BFR spacecraft, which was first unveiled last September during the International Astronautical Congress (IAC) in Australia. It’s now got larger tail fins and seven engines in its base, as opposed to the original six. When asked on Twitter if the changes were reflective of the current BFR design, Musk responded in the affirmative. To date, most of the development work has been done on the spacecraft element, reports SpaceNews, and it could be ready for short suborbital “hops” next year. 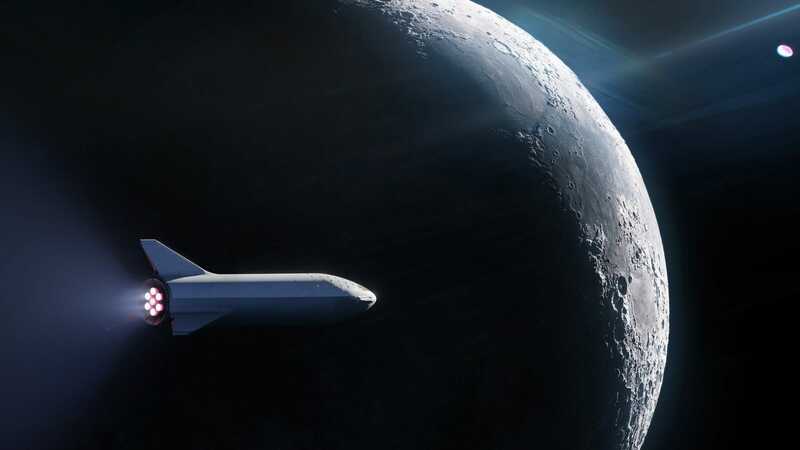 Reminiscent of the retired Space Shuttle, the reusable BFR spacecraft could potentially carry a dozen, if not dozens, of passengers around the Moon. Or Mars. As for the rocket portion itself, which will also be reusable, it’s still about one to two years away from an initial test flight, according to the Wall Street Journal. Yesterday’s announcement can be interpreted as a strong sign that SpaceX is steadily turning its attention towards the BFR project, and at the expense of the Falcon Heavy project. The future of SpaceX, as the company has consistently reiterated, will involve the human exploration of space, whether it be lunar flybys or colonies on Mars. The company believes there’s money to be made in space tourism, whereas global demand for the launch of large commercial satellites is slipping appreciably and the appeal for smaller satellites steadily increases.